FORT LEONARD WOOD, Mo. (Aug. 8, 2018) — Fort Leonard Wood welcomes Brig. Gen. Brian Bisacre as the 50th commandant and chief of the Military Police Corps. 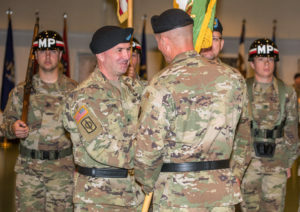 The U.S. Army Military Police School held a change-of-commandant ceremony Tuesday at Fort Leonard Wood’s Nutter Field House where they said farewell to Brig. Gen. Donna Martin and welcomed Brig. Gen. Brian Bisacre as the 50th commandant and chief of the MP Corps. Savre said the responsibility of leading the MP School and Corps must only be entrusted to the most committed and competent senior leaders. He added that Martin has more than lived up to the responsibility. Martin said the regiment is set for success with Bisacre in charge. After welcoming the Bisacre family back to the installation, Savre said Bisacre has an impressive resume. “Having served as the assistant commandant just three years ago and most recently as the commanding general of U.S. Army Corrections Command and the deputy commanding general of the U.S. Army Criminal Investigation Command. With his wealth of experience, extraordinary vision and inspirational leadership — the Army could not have picked anyone better to take on the responsibilities of leading our Military Police School into the future,” Savre said. Bisacre thanked Army senior leaders for their trust and confidence in him to lead and then listed three promises to the regiment. Brig. Gen. Brian Bisacre receives the colors from Maj. Gen. Kent Savre, Maneuver Support Center of Excellence and Fort Leonard Wood commanding general, signifying his taking command of the U.S. Army Military Police School in a ceremony Tuesday at Nutter Field House.